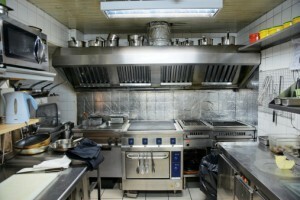 In order to operate your commercial kitchen safely, comfortably, and legally, you must have three vital systems in place: an exhaust fan, a swamp cooler or other ventilation source, and an automatic fire suppression system. When any one of these items requires repair or service, you need to get the job done fast to avoid shutting down your kitchen during business hours and missing out on revenue. Fortunately, Flue Steam can help. We offer reliable emergency service for all of your kitchen air control and fire suppression equipment 24 hours a day, 7 days a week. Just give us a call and we’ll come make sure your system is working properly and will meet your compliance requirements. The purpose of a kitchen exhaust fan is to draw hot, smoky, greasy air out of the kitchen. This not only makes the kitchen more comfortable for your staff, but also safer. Without a working exhaust fan, vaporized grease generated by cooking wouldn’t get sucked up and away from your cooking surfaces into grease filters where it can be safely trapped. Instead, it would accumulate on various surfaces and cause a fire hazard. If your exhaust fan isn’t working like it should, one of our skilled technicians can fix it. We can repair or replace fan motors, bearings, pulleys, belts, etc. for a lasting and reliable repair. Swamp coolers are an efficient source of cool, fresh air for many commercial kitchens. However, if your swamp cooler stops producing enough cooled air, you can end up with a hot, smoky kitchen that isn’t comfortable or safe to work in. At Flue Steam, our technicians are intimately familiar with all makes and models of commercial swamp coolers. We can troubleshoot your swamp cooler problem and provide a targeted and effective repair, whether that means replacing the float valve, pump, pads, belts, etc., or just cleaning and resealing the unit. An automatic fire suppression system is a very important safety device for any commercial kitchen. Obviously this piece of equipment won’t do you much good if it is not in excellent working condition. At Flue Steam, we can provide emergency service to reset and recharge your automatic fire suppression system after each activation, as required by law. Our fast response means you can get back to cooking—and making money—faster. Call us any time you need help and we’ll be on our way as quickly as possible.